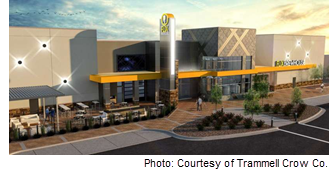 SAN ANTONIO – Flix Entertainment has filed plans for a 39,000-sf movie theater and brewery on the city's far west side after buying 5.9 acres there in July. Construction on the $8.3 million project, located at 345 Loop 1604 near Potranco Rd., is expected to last from August 2018 to May 2019. ​​Check out San Antonio-New Braunfels Retail Market Research.